I have hinted about this, but it has taken me eight months to actually decide to openly speak of it. Last December, Sijo Steve Muhammad gave me one of the greatest honors of my life, something I never dreamed of receiving. 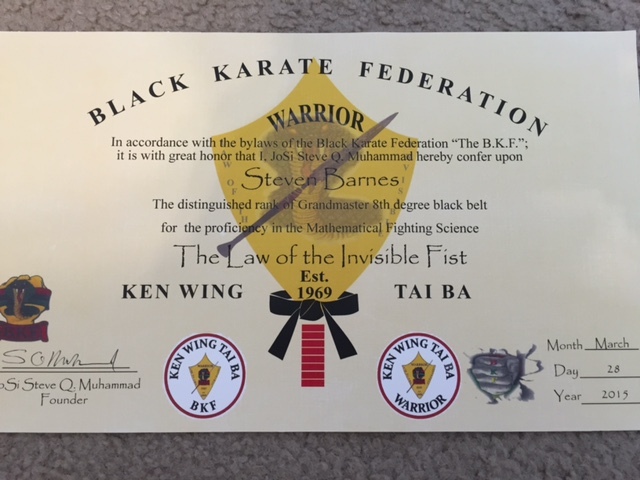 All I ever wanted was to stop letting fear control me…and then of understanding just a little of the martial sciences that had called me since childhood. I can only humbly believe that this honor is a statement of what my commitment must be for the rest of my life: to share the body-mind sciences with which so many wonderful men and women have entrusted me. Announcement about how I plan to do that will be seen tomorrow, and heard on the Lifewriting radio show Saturday. Sigh. Well, I guess I’ve stalled long enough…here it is. ← Psst…want to know the future? Wow. An achievement to be proud of! Congrats! Great honor and great achievement. Congratulations, Steven. Thank you. My only question now is: what can I give life that is equal to such a wonderful gift? I’ll be answering that one for years.